Hinweis: Die Rechteinräumung gem. der Creative Commons Namensnennung 3.0 Lizenz hat nur für diesen Text Gültigkeit, nicht jedoch für die darin abgebildeten geschützten Werke der bildenden Kunst. This paper will show the connection between Surrealism and American Abstract Art, citing in particular the works of André Masson, Jackson Pollock and Cy Twombly. During the crucial years 1938-1947, a cultural transfer took place when the greater part of the European Surrealist group was transplanted to New York. Masson came to the United States in June 1941, living first with his family in Washington and later on a farm in New Preston, Connecticut. During his exile Masson was extremely productive. Between 1941 and 1945 he created more than 100 paintings, 50 graphic works and about one dozen sculptures, together with a large number of drawings, watercolors and pastels. In New York, the Atelier 17 of Stanley William Hayter became an important connection point between the surrealists and American abstract artists. Masson and Pollock both worked there. Pollock's works show a significant affinity with the works of André Masson. This paper will discuss the influence of automatic drawing on the American abstract artists. Jackson Pollock's work Number 32 of 1950 shows, for example, the radical change in abstract painting after World War II. This work is a rare large example of the classic >drip painting< which Pollock made between the years 1947 and 1950. Pollock worked with the >gob process<, in which the flow of paint can be controlled through the consistency and the quantity of the absorbed pigments, but mainly through rapid hand and arm motions. Without direct contact between painting utensils and image, the artist's medium has an important role to play in the creative process. >Drip painting< should be understood as a rejection of traditional painting. The surrealist tradition of automatism played an important role not only for Jackson Pollock, but also for Cy Twombly. To him, the motions of drawing came spontaneously, almost automatically, powered by feelings. Inwardly moving themes can be released and restrained with the help of the hand and body. 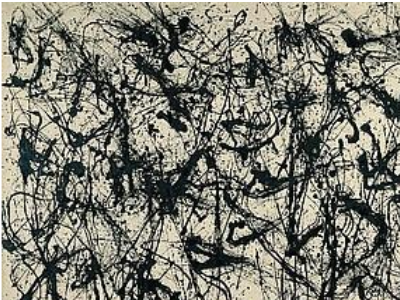 As with Pollock's >action paintings<, speed and body movement came to the fore.